Happy autumn! We’ve been counting down the days to sweater weather and we’ve got just the thing to welcome in the new season. 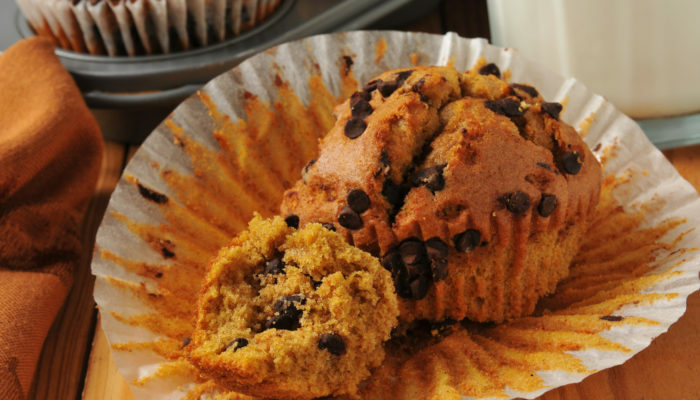 What better way to start autumn off right than with pumpkin chocolate chip muffins? These goodies are a game changer and the perfect introduction to fall. Enjoy! Preheat oven to 400. Place paper liners in a regular sized muffin pan. In a large bowl, beat the eggs, sugar, pumpkin and oil until smooth. Combine the flour, baking soda, baking powder, pumpkin pie spice and salt. Add flour mixture slowly to pumpkin mixture and mix well. Fold in chocolate chips. Fill greased or paper-lined muffin cups three-fourths to almost the way full. Bake for 15-17 minutes or until a toothpick inserted near the center comes out clean. Cool in pan 10 minutes before removing to a wire wrack.